Solar energy currently provides only a quarter of a percent of the planet’s electricity supply, but the industry is growing at staggering speed. 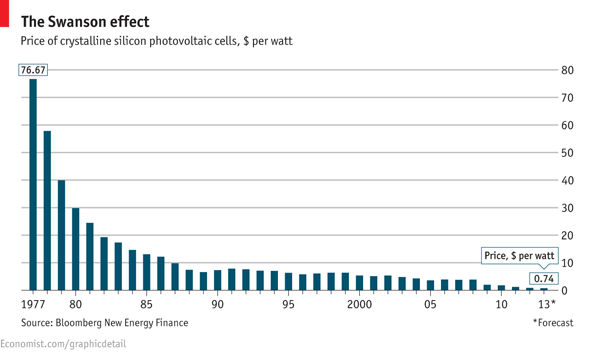 Underlying this growth is a phenomenon that solar’s supporters call Swanson’s law, in imitation of Moore’s law of transistor cost. Moore’s law suggests that the size of transistors (and also their cost) halves every 18 months or so. Swanson’s law, named after Richard Swanson, the founder of SunPower, a big American solar-cell manufacturer, suggests that the cost of the photovoltaic cells needed to generate solar power falls by 20% with each doubling of global manufacturing capacity. The upshot is that the modules used to make solar-power plants now cost less than a dollar per watt of capacity. This means that in sunny regions such as California, photovoltaic power could already compete without subsidy with the more expensive parts of the traditional power market. Moreover, technological developments that have been proved in the laboratory but have not yet moved into the factory mean Swanson’s law still has many years to run. See full article in the Economist.